Atrazine, the chemical weed killer used on tens of millions of acres of corn in the U.S., is hazardous to our health and to the environment. Evidence suggests that exposure to atrazine damages men and women’s reproductive health, weakens immune systems in wildlife, and may contribute to the risk of cancer. So what’s the tradeoff? In 2011, five papers sponsored by Syngenta, a European company that produces atrazine, claimed that the potent, low-cost herbicide has huge economic benefits. But a recent Synapse study on behalf of the Natural Resources Defense Council (NRDC) finds that the Syngenta analyses, which rely on flawed economic assumptions, exaggerate atrazine’s benefits while overlooking non-harmful alternatives. Syngenta’s “Atrazine Benefits Team” ignores non-chemical or low-chemical alternatives to atrazine, including methods such as crop rotation, intercropping, enhanced crop competitiveness, and other techniques that have the advantage of not proliferating herbicide-resistant weeds. Meanwhile, atrazine resistance has been detected in six of the ten most common weeds that contribute to weed pressure on corn. The papers also omit or inadequately assess alternative herbicide combinations that may offer comparable or even superior weed-killing power. Even if one accepts the overstated effects of atrazine on crop yields, two of the three Syngenta papers that project economic impacts make the erroneous assumption that corn prices will remain constant regardless of crop yield. In fact, the price of corn fluctuates in response to changes in supply and demand. According to the one Syngenta paper that uses a more sophisticated model, eliminating atrazine would result in a 4.4 percent reduction in corn production and an 8 percent rise in the price of corn. As a result, corn growers’ revenue would increase by 3.2 percent (or $1.7 billion). 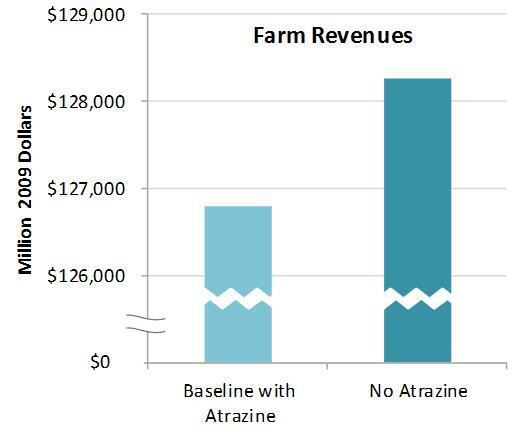 The graph below illustrates the impact of eliminating atrazine on farm revenue from ten crops, including corn. Rather than focusing on how eliminating atrazine would benefit corn growers and their families—not only in terms of revenue, but in terms of avoided health and environmental risks—the Syngenta team focuses on the “losers” in an atrazine-free scenario. Of the 11 billion bushels of corn produced in the United States in 2012, 40 percent was used for ethanol production and 37 percent for animal feed. Ethanol and livestock producers would take the biggest hit if corn prices were to rise. And consumers? Ethanol is blended into gasoline and generally represents 10 percent or less of the total volume. An 8 percent increase in ethanol prices—a high estimate, since costs of ethanol production other than corn would not be affected—would lead to a less than 1 percent increase in gasoline prices ($0.03 per gallon at today’s prices). Meanwhile, agricultural research shows that a 6 percent increase in the price of corn translates into a 1 percent increase in the price of beef. At that rate, Syngenta’s atrazine-free scenario, with its 8 percent increase in the price of corn, would add only one penny to the cost of a quarter-pound burger, and a nickel to the cost of an 8-ounce steak. In other words, it would cost consumers only pennies to eliminate a toxic agricultural practice, increase farm revenues, and improve human and environmental health. For more information, view the full report: Atrazine: Consider the Alternatives. If you’re short on time, read about key takeaways in the executive summary or check out this blog post from NRDC.